REAL Digital TV is a satellite TV service focused on providing you with all the channels you need to keep you entertained. We are passionate about what’s on! But TV doesn’t need to be expensive to get what you want when you want it. 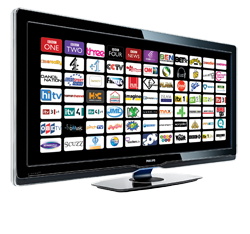 REAL Digital offers all the great channels you know and love, there are even HD channels free as part of the service. We then go one step further and offer a small selection of channels you may want to add on without the need for an expensive subscription. REAL Digital is supplied to you via one of our set-top boxes. These plug into your TV like any other set-top box, DVD player, satellite box or accessory and once installed, will provide you with all the TV you need. YES, you will need a satellite dish if you haven’t already got one, REAL uses the same satellites as both SKY and freesat. The great thing about one of our boxes, is once you have the reception it's good to go. All our set-top boxes come with a viewing card that enables viewers to use the 7 day TV guide, organizes the channels in the correct order and if you have the REAL Digital+ set top box allows series linking and the ability to plan your viewing schedule. Additional services such as premium and Pay per View events can be easily added if you wish to subscribe to them and will be typically available on a month-by-month basis. Got broadband, connect your REAL Digital set top box to your Broadband service and open up a world of catch up services. BBC iplayer and other catch up services are available and a full IP media centre and VOD services are being finalized. REAL Digital is focused on providing YOU, the consumer, a great deal. We love TV and don't believe it should be expensive with long contracts you can't get out of. That's why we will provide channels and services that you will want to watch, as well as avoiding restrictive and cost prohibitive monthly contracts where we can. For launch, we will have up to 400 channels, including 5 in stunning HD. The service will launch with a small concentration on pay channels known as ‘REAL Essentials'. As you will note in our News section, we intend to have a premium sports pack called ‘SPORTS Essentials’, additionally Pay-per-view services will be added within the year. REAL Digital will launch in the UK and the Republic of Ireland, therefore viewers will have the correct regional channel lists and the Irish terrestrial channels will be included where applicable.